If you have a stock you’d like painted by David Tidwell, visit DallasAirbrush.com, call 214-529-4410 or email: david [at] dallasairbrush.com. Dallas Airbrush currently sprays out of Texas Body Works, 2415 Midway Rd Suite 111, Plano, TX 75025. Share the post "Amazing Air-Brush Paint Job on McMillan 50-LBR Stock"
Applied Ballistics has just released a fully upgraded version of its popular Tactical App for Android devices. Bryan Litz tells us: “AB Tactical has received a major overhaul (including a new Bullet Library with over 420 options). The upgrade will require that you uninstall the previous version that you have of the application and then install this new version. This is due to the complete re-write of the internal database handling.” NOTE: You need to record your gun-specific data before you install the new version. Details of the updated AB Tactical App are featured in the new 19-page USER Manual. NOTE: This upgrade is for the Applied Ballistics Tactical Version only. There is no iPhone version of this App, and this is not the standard app that can be purchased from Google Play, or iTunes. 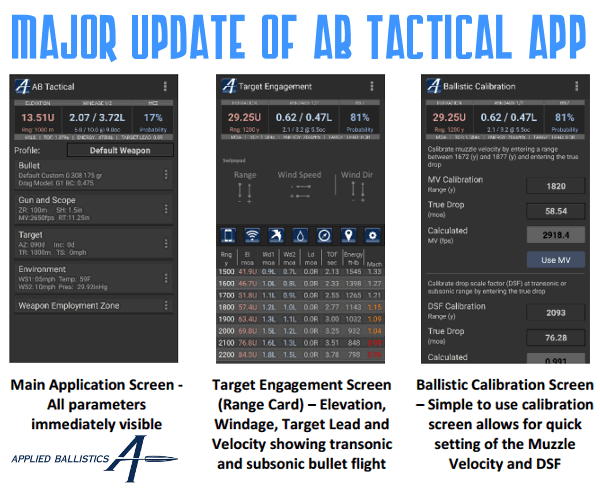 Share the post "New Version of AB Tactical App Released"